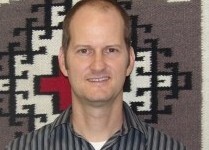 Kevin English, DrPH is the director of the Albuquerque Area Southwest Tribal Epidemiology Center (AASTEC). Kevin has been working with tribal communities across the country since 1995 as a researcher, public health practitioner and a clinical pharmacist. He received a Bachelor of Science Degree in Pharmacy from the University of Iowa in 1995 and a Doctorate in Public Health Degree from Columbia University in 2013. Prior to becoming the AASTEC Director in 2011, Kevin led the development and implementation of several tribal cancer control and public health capacity development initiatives in collaboration with the seven consortium Tribes of the Albuquerque Area Indian Health Board. The overarching theme of all of the work that Kevin has been engaged in is to address and ameliorate health disparities experienced among American Indians in the Southwest and throughout the country. Michele Suina, PhD, is from Cochiti Pueblo. She is the Program Director for the CDC Good Health and Wellness in Indian Country Program at the Albuquerque Area Southwest Tribal Epidemiology Center. Michele is a health educator and chose this career path to contribute to the health and vitality of Native American people. She is passionate about making changes to standard western approaches to health education and public health so that tribes realize their own self-defined health goals. Michele received a Bachelor of Science in Health Education from the University of New Mexico and a Master of Science in Justice Studies from Arizona State University. In 2015, she completed her doctoral studies and graduated from Arizona State University School of Social Transformation as part of the first Pueblo PhD cohort in Justice Studies. Michele enjoys spending time with her daughter and two dogs. 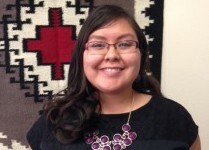 Danielle is a member of the Navajo Nation and originally from Farmington, NM. She received her Bachelor of Science Degree in Biology and Psychology from the University of New Mexico. In January of 2015, she joined the team at the Albuquerque Area Southwest Tribal Epidemiology Center as a part-time research assistant. She provides data entry and assists with various projects occurring in AASTEC. Before joining the center, she worked as an Enrollment Specialist at Big Brothers Big Sisters of Central New Mexico. She has interests in working with Native American communities in health promotion and disease prevention. Daytona Raye is an enrolled member of the Dine Nation, originally from Rock Point, AZ. Daytona is Tachii’nii (Red Running into the Running Water) clan, born for To’ahani (Near the Water Clan). Her maternal grandfather are Tlaashchi’I and her paternal grandfathers are Tabaahi. Ms. Raye received a Bachelor of Science in Exercise Science from Fort Lewis College; and a Master of Science in Community Health Education. Prior to joining AASTEC in January 2017, Daytona worked for the Public Education Department- Indian Education Division working with the 23 school districts and the 22 NM Pueblos/Nation. She also worked for John Hopkins Research Center and the Pueblo of San Felipe. As the CDC Good Health and Wellness in Indian Country Program Coordinator, Ms. Raye’s goal is to provide technical assistance, incorporate community identified needs, and assist with implementing CDC initiatives in collaborating with tribal communities and schools. Delrae is Navajo originally from Prewitt, New Mexico. She has lived in Albuquerque, NM for the past 17 years. She is a devoted mother of 3 beautiful children. In the fall of 1997, Delrae attended the Albuquerque Technical Vocational Institute and earned a certificate as a Health Unit Clerk. She worked at Presbyterian Hospital on the Postpartum/Newborn Nursery Unit as a unit secretary for 11 ½ years. In September of 2011, Delrae joined the team at the Albuquerque Area Southwest Tribal Epidemiology Center as an Administrative Assistant. 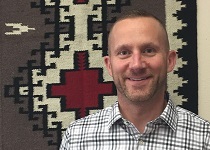 Eric Chrisp began working as the Evaluation Specialist for the Albuquerque Area Southwest Tribal Epidemiology Center (AASTEC) in late 2015. He received a Bachelor of Science in anthropology and psychology from the Eastern Michigan University in 1992. In 2000 he completed a Masters of Arts in applied anthropology from the University of South Florida. Mr. Chrisp has been working in public health research and program evaluation since 2001. His professional interests have included commercial tobacco control, chronic disease prevention, health disparities, race and ethnicity issues, political economy, community development, empowerment theory and social/ecological models. In his private life Mr. Chrisp spends time with his children and manages a small homestead where he practices sustainability and regenerative agriculture. Janna Vallo is from the Pueblo of Acoma. She is the Commercial Tobacco Control and Prevention Coordinator under the CDC Good Health and Wellness in Indian Country Program at AASTEC. Janna received her Bachelor of Arts degree in Psychology with minors in Counseling and Educational Psychology from New Mexico State University. She is currently enrolled at the University of New Mexico Public Administration Graduate Program. Janna is a Certified Prevention Specialist. Previous to working at AASTEC, Janna coordinated the Alcohol, Tobacco and Other Drug Abuse Prevention Program in three NM Pueblos, where she worked with the community coalitions implementing the Strategic Prevention Framework to change norms around youth substance use. Janna has worked in the field of Commercial Tobacco Prevention, is a commissioned officer through the FDA for Tobacco Advertising, and Chairs the Southwest Tribal Tobacco Coalition in providing network and training opportunities for Tribal communities seeking to build their capacity around Commercial Tobacco Prevention. Jerrod Moore is Dine’ (Navajo) from Tohatchi, New Mexico and has lived in Alaska for the last 3.5 years where he worked as the Peer Prevention Coordinator and Injury Prevention Specialist at the Bristol Bay Area Health Corporation. As the Peer Prevention Coordinator he spearheaded the Project Zero program, which focused on reducing suicides throughout the Bristol Bay Region. He also helped establish youth groups in surrounding communities advocating for safe and healthy communities. He graduated from the University of New Mexico earning his B.A. in Native American Studies concentrating on Leadership and Building Native Nations. He is currently participating in the Indian Health Services Epidemiology Fellowship which consist of developing a research project with Tribes served in the Albuquerque Area. Earlier work includes eight years with the New Mexico Youth Conservation Corp and seasonal work as a commercial fisherman/cattle rancher. Jerrod enjoys working with different Tribes and is excited for the new experiences, challenges, and learning opportunities that lay ahead. 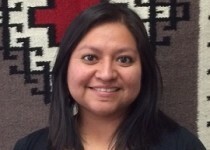 Judith (Judy) Espinoza has been with the Albuquerque Area Southwest Tribal Center as an Epidemiologist since 2010. She came to us with a decade of public health experience and received her MPH in Epidemiology from the University of New Mexico in 2004. Both her background and interests encompass clinical microbiology and environmental epidemiology. One of her primary responsibilities is working on the Southwest Tribal Youth Project that focuses upon analyzing and reporting Native American youth risk and resiliency data for grades 6th-12th. Ms. Espinoza also serves as the lead epidemiologist on the Acoma Pueblo Strategic Prevention Framework Tribal Incentive Grant (SPF TIG). One of Judy’s particular specialty areas is to assist tribal communities in the design and construction of health related databases.One of her primary responsibilities is working with New Mexico and Colorado states’ biannual Youth Behavioral Surveillance System (YRBSS) data for Native American students in grades 6th through 12th. One of Judy’s particular specialty areas is to assist tribal communities with the collection, storage and analysis of community data thru databases. In her private life she is a Bernalillo County Master Composter and amateur organic gardener and enjoys volunteering at a local food pantry’s community garden. 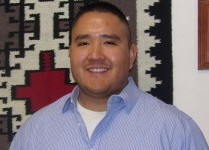 Matthew Frank, MSW, MPH, is an enrolled member of the Navajo Nation. He graduated from the Brown School at Washington University in St. Louis with a M.S.W., M.P.H., and graduate certificate in Violence & Injury Prevention. He also has a B.S. in Biochemistry with a minor in Biology from Fort Lewis College; and a B.A. in Sociology with minors in Anthropology and Gender & Women Studies from the University of Missouri–Kansas City. He has broad interests’ on the social influences on health, especially the health of vulnerable populations; and how disability and disease become linked to inequality and the everyday practices and social factors that produce various forms of suffering. He has coordinated social service programs and conducted research on outcome assessments and interventions to improve mental and physical health, cognition, and participation among vulnerable populations, including persons with disabilities and chronic conditions as they transition to community living. His goal is to align the resources of the community and the non-profit sector with the ongoing initiatives and visions that are emerging from the academy to create positive social transformations within Native communities. Miriam Sosa was selected by the Centers for Disease Control and Prevention to work with AASTEC as part of the Public Health Associate Program (PHAP.) . Ms. Sosa leads database development for different tribal programs, conducts workshops, and provides technical assistance. She is fluent in Spanish and has a B.S. in Public Health from San Francisco State University. Before joining the Center, Ms. Sosa worked as an Overnight Crisis Counselor at a women’s emergency domestic violence shelter and was part of the research team that contributed to the study, Garden of Truth: The Prostitution and Trafficking of Native American Women in Minnesota. Ms. Sosa is originally from Oxnard, California, a small agricultural town which inspired her to film and co-direct, The Price of Oil, a short film documenting the negative impact of an oil refinery in Richmond, California. 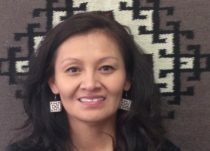 Ophelia Spencer is member of the Navajo Nation with 7 years of public health research experience and utilizing cultural knowledge to bridge understanding of scientific terms and methodologies in tribal communities. 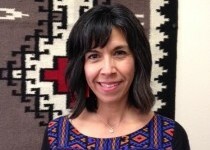 Ms. Spencer joined the Albuquerque Area Southwest Tribal Epidemiology Center in September of 2011, and leads the coordination, organization, and implementation of tribal community health assessments throughout the Albuquerque Area. Her current efforts focus upon Tribal Behavioral Risk Factor Surveillance System (BRFSS) surveys and the New Mexico Youth Risk and Resiliency Survey (YRRS). Ms. Spencer is fluent in both English and Navajo. Savannah Gene is a proud member of the Diné Nation, originally from Bee Ak’id Baa Ahodzaní (Pinon, Arizona). Savannah is Totsóhnii (Big Water Clan), born for Hashk’áánhadzohí (Yucca Fruit Strung Out in a Line Clan). Her maternal grandfathers are Ta’neeszahnii (Tangle People Clan) and her paternal grandfathers are Tł’izíłání (Many Goats Clan). She is a proud mother to her son, Ethan. 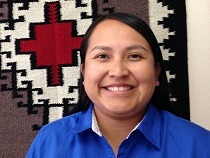 Savannah is currently the Program Administrative Coordinator at the Albuquerque Area Indian Health Board, working with various programs including the CDC Good Health and Wellness in Indian Country and HIV Testing programs. Previously, she assisted on the NARCH HIV/AIDS Evidence Based Intervention adaptation project. Savannah graduated from the University of New Mexico with a Bachelor of Arts in Environmental Planning and Design, with an emphasis in Community Planning, and is in the process of applying for a Master’s in Public Health program. On her free time, she enjoys spending time with her son and family, reading, and running. Alison (Ali) Anderson was selected by the Centers for Disease Control and Prevention to work with AASTEC as part of the Public Health Associate Program (PHAP.) She has a B.S. in Biology and a graduate certificate in Nonprofit Management and Theory from the University of Georgia. During her undergraduate career, Ms. Anderson was an undergraduate research scholar, conducting research in microbiology, ecology, and veterinary pathology. Prior to coming to AASTEC, she served as an intern at the District of Columbia Department of Health. Sheldwin earned a doctorate degree in Exposure Science and a MS degree in Epidemiology at the University of Washington School of Public Health; prior he also received a MPH at the University of New Mexico School of Medicine. During his MPH studies, Sheldwin designed and developed an epidemiologic case-control study titled “Understanding Lung Cancer Risk among Navajo Former Uranium Miners”. For his dissertation, Sheldwin designed and developed an indoor radon prediction model for homes on the Navajo Nation. For this project, he designed a survey questionnaire for homes, collected indoor radon measurements, and geospatially mapped homes on the Navajo Nation. He then combined this information with geographic land covariates thought to be associated with indoor radon to develop an indoor radon prediction model. His goal in public health is to improve the health of all communities with a focus on disparate environmental exposures and disease rates among disadvantaged populations, specifically on American Indian/Alaska Native populations. Lucinda Cowboy is Diné (Navajo) from Chi Chil Tah, New Mexico. She is the Program Coordinator for the Tribal Epidemiology Center Public Health Infrastructure Program funded by the Centers for Disease Control and Prevention at AASTEC. She received a Bachelor of Science in Allied Health Administration at Northeastern State University in Tahlequah, Oklahoma and received a Master of Science in Community Health Education at the University of New Mexico. Prior to joining AASTEC, Lucinda was an independent contractor with Healthy Native Communities Partnership as a Native Weaver and for a short-term contracted with the New Mexico Breastfeeding Task Force as a Tribal Coordinator. She has extensive experience with community outreach as a health educator, prevention specialist geared towards diabetes and substance abuse prevention along with research coordination among different health projects, and also as a tribal liaison to Native American communities. She has also engaged with and built working relationships with individuals, various groups and organizations with the Native American communities in New Mexico. Lucinda is also a proud mother to two beautiful kids. Eudora Claw is Diné (Navajo) and Zuni Pueblo from Cahone Mesa, Utah. She earned her Bachelor’s Degree in Evolutionary Biology from the University of New Mexico in 2012, and her Master’s in Public Health from the University of Nevada, Las Vegas (UNLV) in 2014. Ms. Claw is working towards a Ph.D. in Public Health with a concentration in Social and Behavioral Health within the School of Community Health Sciences, UNLV. Her proposed dissertation project will use a qualitative interview method and the Social Ecological Model to investigate the question of how tribal victim service advocates in eight tribal communities that have exercised special domestic violence criminal jurisdiction (SDVCJ) under VAWA 2013, are developing approaches to their advocacy services and prevention activities to reduce domestic violence. Currently she is the Community Epidemiologist for the Tribal Epidemiology Center Public Health Infrastructure Program funded by the Centers for Disease Control and Prevention at AASTEC.